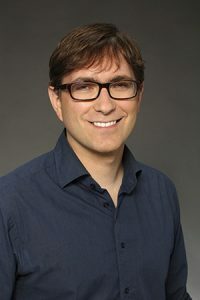 In Tampa, Florida, on Monday, September 26, as part of the ASTC Annual Conference Signature Speaker Series, Sascha Paladino (creator and executive producer of Disney Junior’s Miles from Tomorrowland space-adventure animated television series) spoke about how he was inspired to create a show that would be a family adventure. He was joined by the show’s science consultant, Randii Wessen of NASA’s Jet Propulsion Laboratory (JPL), and representatives from three science centers that have used the series as a base for public programming with younger audiences: Jennifer Barlup, director of floor experiences at COSI, Columbus, Ohio; Christian Greer, chief education and experience officer at the Saint Louis Science Center (SLSC), Missouri; and Janella Watson, director of early childhood education at the New York Hall of Science (NYSCI), Queens. He decided the answer was to go into space with the family, perhaps not a surprising decision for a father-to-be who grew up interested in science and space, visiting New York City’s American Museum of Natural History often, and even participating in a children’s space workshop at its Hayden Planetarium (which he enjoyed so much he still retains the workshop graduation certificate). 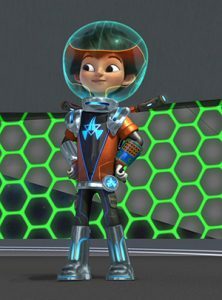 Miles from Tomorrowland follows the adventures of the Callisto family, who live on a spaceship called the Stellosphere, from which the parents work for the Tomorrowland Transit Authority. Miles is a curious, slightly reckless, enthusiastic 7-year-old; Loretta is his 12-year-old sister, a technology whiz and coding genius; Phoebe is their mother, a scientist who is the ship’s captain; and Leo is their father, a scientist who is the ship’s engineer. “It may be called Miles From Tomorrowland, but it’s about the whole family,” said Paladino. Paladino and Wessen strive to present STEM content in the show, which was developed with extensive input from scientists and engineers, including John Spencer, a space architect/designer; Yvonne Cagle, a scientist, physician, and NASA astronaut; Rachel Blum, a Google engineer; and people at Google’s “Made with Code” initiative to empower young women in middle and high school with computer programming skills. Paladino, as the series’ creator and executive producer, focuses on developing interesting, exciting, adventurous stories that will draw children in and then works with Wessen on getting the science right, making episodes that hold kids’ attention and provide opportunities for wonder. Paladino and Wessen shared some examples of how the exciting, fictional stories on Miles from Tomorrowland are rooted in science but retain a wonderful fictional license in order to appeal to children’s love of fantastic tales. There’s an episode with Miles preparing breakfast for the family: pancakes. Pancakes flipped in space, of course, would float and Miles could chase them around, trying to catch them. But after reviewing that script, Wessen pointed out that the characters are actually in an environment with one-third of the Earth’s gravity, so the pancakes wouldn’t float. “That was a case where, you know, the science was hard to justify.” So, in the next version, Miles was made to accidently add “propulsion powder” to the pancake batter, which had the impact of producing flipped pancakes that then zoomed around wildly. A typical Miles adventure. In an episode focusing on young Loretta’s solving a problem by writing a computer program, the script was revised after input from software engineers and code writers. They pointed out that Loretta’s efforts were flawless, working beautifully, when in fact code needs to be revised extensively before it actually works. The computer scientists made the writers re-do the episode in order to show the crucial usefulness of failure and persistence. There is also an escaped-animal episode, which many television programs have featured. Only on Miles from Tomorrowland, Paladino wrote it as a tardigrade (a micro-animal colloquially called a “water bear.”) Although the tardigrade was improbably the size of a pony when it got loose from the space station, the escape was an opportunity to explain that tardigrades are a super-hardy species that can survive the vacuum of open space and solar radiation for a time. “We take a real science fact and twist it and make it fun,” Paladino said. “We want to inspire kids to explore more,” Wessen added. 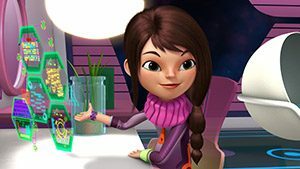 Indeed, the show’s characters and fun, science-based plot lines have proved to be a great launching point for programs at several science centers, as described by members of the panel. “We set up the experiences in our little kidspace gallery as “Miles needs help with new gadgets,” said Jennifer Barlup, director of floor experiences. The activities helped stoke invention and design skills within the context of imaginative space adventures. “It was exciting to see kids interacting with the show but not watching TV,” she said and also noted that children’s fathers were participating in these early childhood programs more than they had in the past. The programs have also been rewarding to develop when thinking of the long arc formative experiences can have. “What if the first person to walk on Mars is getting their start now watching this show?” she said. NYSCI’s Little Makers gallery served as home to a series of activities related to the show, and hosted a splashy kick-off event for the program with the local community. The event included opportunities to experience new technologies, including virtual reality and 3D printing, and to meet Miles from Tomorrowland voice actors, including Bill Nye, as well as NASA astronauts “who really got into launching stomp rockets with the kids,” said Janella Watson, director of early childhood education. Using Miles from Tomorrowland as a springboard, NYSCI hoped to model active problem solving among young visitors, a behavior in which the show’s young protagonists are often engaged. “If they’re not future scientists, at least they’re becoming future problem solvers and thinkers,” she said. The impact of Miles from Tomorrowland is also felt around the world. Paladino shared a recent tweet he’d received from a preteen in Malaysia, who had built his own version of a Blastboard like the one Miles has. (“It’s a type of hovering skateboard, like in Back to the Future II, which I always wanted,” Paladino explained.) The boy’s engineering project was made with magnets, and he even sent Paladino a video of his team of 12-year-old scientists, who’d all been tinkering around and come up with their version. Tim Ritchie, president and CEO of the Tech Museum of Innovation in San Jose, California, found this Signature Series presentation enlightening. “Science centers are great at words and data, but not great at other ways of knowing. This was a good example of a full-fledged type of engagement, with emotions and other engagements that we need to be better at,” he said.